Trousers are often thrown on without a second thought about style, cut or colour – which, when you think about it, is rather strange. Although we wear them everyday, would look every shade of stupid without them, and rely on them to keep us smart, warm and to tie our outfit together, the majority of men have just a handful of trousers that they rely on; work, leisure, gymwear. But here are the 5 pairs of trousers you really need to own in order to round out your leg wear, and keep things sartorially sound below the belt. 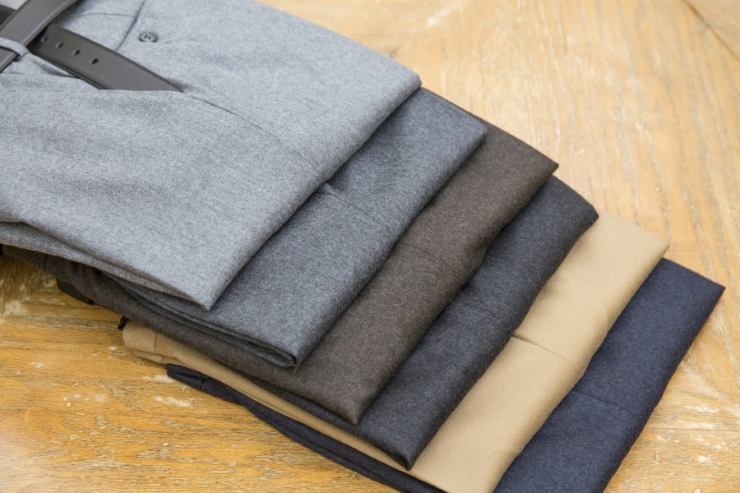 The kings of smart casual, the chino is one of the most versatile trousers out there. Slim-fit, tapered, pleated – you name it. Cotton, linen, wool – whatever you want. But, remember, there are stalwart colours in this style, from the navy to the sand, and they’re popular for a reason – these colours are natural, neutral, and will go with almost any shirt or jumper in your wardrobe. It is said that jeans first found popularity with miners in the California Gold Rush, and their comfort and durability has seen them go on to become a staple of the male wardrobe. Modern denim comes in every colour, fit and wash – but a simple pair of dark blue, slim-fit jeans remain hard to beat. Here are the blues you should be buying.